Entrepreneur Olivia Carr always knew America's most famous family would love her silk pillowcases. Two weeks ago, Kourtney Kardashian generated a wave of social media buzz with the launch of her new lifestyle site Poosh, thanks in part to the elaborate gift boxes she sent out to celebrity friends like Miley Cyrus, Serena Williams and Bella Hadid. 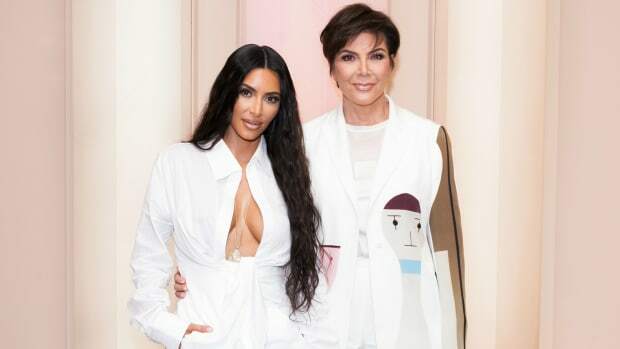 They featured items "hand-selected" by Kardashian totaling more than $4,000, including a pink eye mask by Australian brand Shhh Silk. It was a huge moment for founder Olivia Carr. "This was a genuine request because she loves our product. And in a world where there are literally millions of brands that [the Kardashians] can select from, it is honestly such an honor," says Carr, becoming almost emotional. It was also something of a full-circle moment, as Carr had known she wanted her product in the hands of the famous family even before she&apos;d fully launched it. "That was my very first goal with this business in the first six months," she says. "I said to myself, &apos;I really want the Kardashians to enjoy my product, and I knew that they had been long time lovers of silk pillowcases." It&apos;s a lofty goal for someone without any existing connections to the family, but an understandable one. Before Carr came up with the idea for Shhh, she worked in e-commerce for the apparel company Pacific Brands and was starting to think about her next project. She decided to quit and take her two young children to the U.S. for five weeks in hopes of finding inspiration. Carr had been sleeping on a silk pillowcase for many years on the recommendation of a hairstylist (they&apos;re known to prevent breakage and bedhead), but during that trip, a hotel cleaning crew mistakenly took hers, and she had a hard time finding options she liked to replace it. Her main criteria were a zipper to keep it from falling off the pillow and a nice aesthetic. 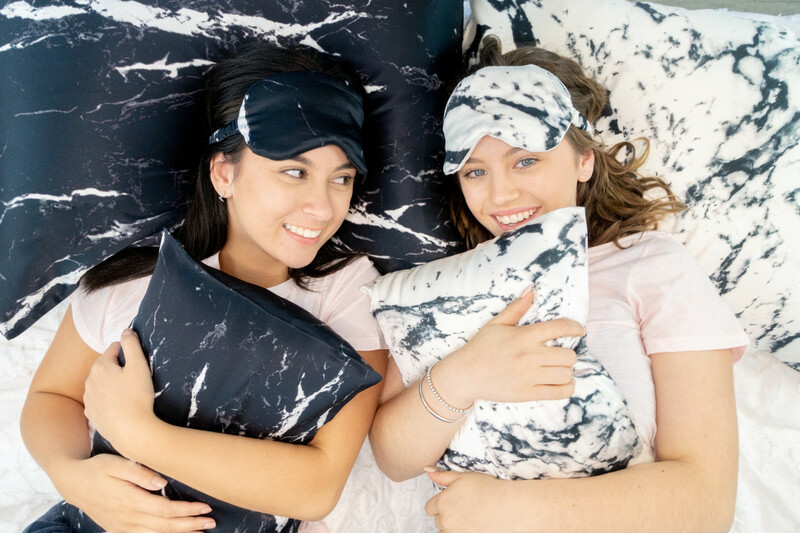 Such a pillowcase didn&apos;t seem to exist, so in 2015, she went to China, learned all about silk, and found people to make them out of a high-quality version that could be machine washed. It wasn&apos;t the first, or the last, time Carr had to do some bootstrapping. After becoming unexpectedly pregnant at 19, having just been accepted into the prestigious National Institute of Dramatic Arts — ending her lifelong dream of becoming an actress — she worked full-time while raising her daughter as a single mother and struggling with undiagnosed postnatal depression. She started her first business — a theater company — at the age of 24 after giving birth to her son with her then-husband. After four years, she burned out and went to Pacific Brands. With Shhh, Carr&apos;s first employee was her then-12-year-old daughter, who, now 17, still helps with customer service. "I always believed in just showing my daughter that she could do and be anything," she says. Carr believes her backstory gives the brand special meaning, as does one other activity she doesn&apos;t really publicize: From the beginning, the brand has used some of its profits to give back. It has partnered with organizations to fight homelessness, given aid to orphans in Tigray and helped reopen a hospital in Africa; Shhh also sent out notes along with orders explaining this "secret" to customers, tying into the name, Shhh. "We really did used to keep it a secret so that we could share it with our customers post-purchase, rather than use it as a lever to get them to purchase," says Carr. She did, however, want the Kardashians to know about this, as she strategized how she could get on their radar. She even did something risky that she&apos;s not entirely proud of. "Firstly, I definitely don&apos;t condone people trespassing or entering into a gated community. But I had no idea gated communities existed," she begins what is clearly going to be a good story. On a trip to Los Angeles, Carr simply made her way to Kris Jenner&apos;s home in Hidden Hills, a gated community, it turned out, in Calabasas. At the time, unbeknownst to Carr, Kim Kardashian and Kanye West were living there while their home was being renovated. Her plan was to drop off a package of pillowcases for the family and a heartfelt note detailing her story and the ways her brand gives back. "What I was explaining to them is... by helping me they were, in effect, helping others," says Carr. She thought bringing it herself would make more of an impact than sending something in the mail that they might never see. "I mentioned [to the security] that I had a meeting with KarJenner Communications [which she did not], and I was let into the estate." This was pre-Paris burglary, it&apos;s worth noting. "When I arrived to the home, they were renovating. So they had a &apos;do not cross&apos; [sign] across the driveway. At that moment, I obviously knew I shouldn&apos;t have been there and I was thinking, &apos;oh, I&apos;ve flown all the way from Australia, I literally just need to drop off the letter and the parcel,&apos;" she explains. "At that exact moment, a UPS truck turned up to be delivering to the exact house. So I was like, the universe obviously is trying to help me. He pressed the doorbell, and I just went in straight after him, and I could hear noises inside and I was thinking, &apos;oh God, just just leave the box and get out of here,&apos;" so she did. And it worked — sort of. In addition to not knowing about gated communities, Carr failed to realize that, obviously, Kardashian West sleeps on a king-size bed with king-size pillows; at the time, Shhh only made queen. "And then she asked to have her initials monogrammed on them; at the time, we didn&apos;t have king and we didn&apos;t have monogramming, so we set about to make them really quickly. We got them all personalized for her and then that was also the launch of our customization on our website," says Carr. After that, in April of 2016, came Shhh Silk&apos;s first big break: Kardashian West featured the brand&apos;s pillowcases in a giveaway on her (now-defunct) app. 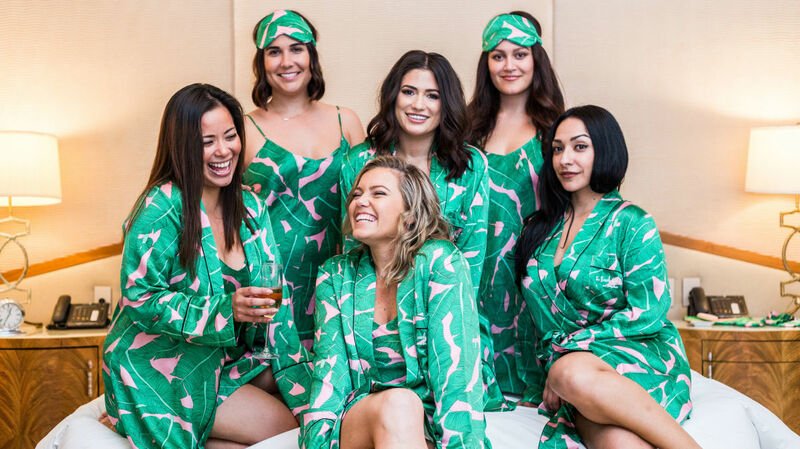 The company&apos;s other big break also involved a Los Angeles icon: the Beverly Hills Hotel, with which Carr has been collaborating on a range of silk products using the institution&apos;s well-known pink-and-green palm print. Like getting in with the Kardashians, nabbing a spot in the hotel&apos;s gift shop was an early goal of hers. "I&apos;m a massive believer in visualizing and manifesting things," says Carr. "We didn&apos;t have sleepwear at the time, but I imagined if we were to have sleepwear, how it would sit in their little store, and I could just really see our brand there. So as with most things that I do, I took the risk and I flew over there with my children with the intention to stay at hotel and have a meeting with someone there." What she didn&apos;t know was that the hotel&apos;s gift shop gets more than 200 such requests per week. "I went into the store when I was there, and I asked to meet with the manager and, of course, I got given the script that they&apos;re so beautifully trained in, which was that she&apos;s not here," says Carr. All she got was the manager&apos;s first name: Kristy. "I went down to the pool with my children, we were just sitting there, and I was thinking, oh, what am I gonna do, blah-blah-blah. And we&apos;re walking back up from the pool, the kids were dripping wet, I was holding like a champagne glass, and I see this lady standing where the store entrance was, and I said to my kids, &apos;That&apos;s Kristy.&apos; And my son looked at me and said, &apos;Mum, they told you she&apos;s not here.&apos; And I said, &apos;No, no. That&apos;s Kristy.&apos; Like I had a feeling that it was Kristy." Reader, it was Kristy. Carr introduced herself, gave Kristy some pillowcases, and asked her to sleep on them and reach out if she was interested. "At 10 the next morning I got an email from her saying, &apos;You&apos;re right. I&apos;m obsessed. We need to meet.&apos;" She placed a large order for products the brand didn&apos;t even make yet, but Carr made it happen and the collaboration has been a huge success ever since. In fact, you know who loves it? The Kardashians. "I got a text message from someone in the store [in 2017] saying, &apos;oh my God, Kendall [Jenner]&apos;s just come in and she&apos;s bought [pajamas] for all the kids.&apos;" The gifts have been documented on Kourtney Kardashian&apos;s Instagram account. Dorit Kemsley recently wore pieces from the collaboration on an episode of "The Real Housewives of Beverly Hills." The brand has also been embraced by influencers; Carr gifts, but doesn&apos;t pay for posts. Despite already having a relationship with the most influential family in the world, Shhh is still a relatively young, developing brand that doesn&apos;t have much of a retail presence yet in the U.S., aside from the Beverly Hills Hotel. Carr hopes to further enter the American market strategically, developing exclusive collections and collaborations with retailers in the same vein as the Beverly Hills Hotel partnership. "I&apos;m obsessed with Sephora," she says. "That&apos;s the dream, to be in the pinnacle of beauty." Currently, though, Sephora, and a number of other U.S. retailers, sell competing label Slip Silk, one of several silk brands that have emerged over the years. Without naming names, Carr says she&apos;s gotten some not-so-positive feedback from at least one of those brands, and it&apos;s been challenging. "I&apos;m very passionate about becoming an advocate for truly empowering [other women] whether they&apos;re a competitor or not," she says. "[Some] competitors definitely don&apos;t share my passion for collaborating." In this spirit of transparency, Carr has also begun sharing business advice on social media. Part of her inspiration to do so came from Spanx founder Sara Blakely. "I&apos;m obsessed with Spanx. As a business model, I think that whole journey of how they came from one product and now they have stores and they have a million different categories — that&apos;s what excites me," she says. "I hope to be the Spanx for silk. That&apos;s my goal." But would North wear it? Before KKW Beauty and Kylie Cosmetics, there was... a whole hell of a lot of legal controversy. Do Magazines Need the Kardashians More Than the Kardashians Need Magazines? Looks like not even America's most famous family can save newsstand sales. The brand's #MyCalvins campaign continues with America's most famous family.